Start your summer vacation with a splash. 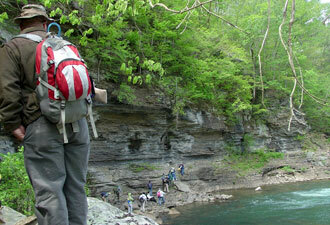 At Little River Canyon, you'll find scenic vistas, world-class white water, and outstanding rock climbing challenges. There is something exciting for nearly everyone. The preserve is home to about 100 rare species of plants and wildlife so don't be surprised if you discover something you've never seen before. Bring your camera to record your memories as you visit this 14,000-acre national preserve. The scenic Canyon Rim Drive, Alabama Highway 176, begins near the 43-foot Little River Falls and winds through 11 scenic miles, past canyon overlooks to Eberhart Point, where the canyon drops nearly 500 feet. Most of the overlooks have picnic tables. You'll find grills and restrooms at Little River Falls on the north end, at Eberhart Point, and at the Canyon Mouth Picnic Area near the preserve's southern border. If you want to cool off in the water, the easiest access is at Canyon Mouth Picnic Area. A $3 per car entrance fee gives you access to the most popular area for picnicking and playing in the river. You can use the grills here, or bring your own picnic basket. At this spot you can wade, fish, or hike upriver to explore the glassy pools between rapids. Canyon Mouth Trail extends a mile along the steep-sided river into the southern end of the canyon. Don't forget to practice water safety by using a buddy system. Wear a lifejacket if you can't swim or if you're paddling. Be aware of the river's awesome power; don't try to swim across the river or upstream of waterfalls. The river rises to a raging torrent in the rapids after heavy rains and becomes no place to play, unless you’re a very good kayaker. The canyon itself is one of the most challenging and scenic kayak trips in the southeast when the water levels are high. Novice paddlers will find backcountry river access an enticing alternative. 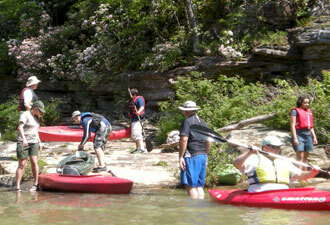 With good water levels, this backcountry float, starting at the southern end of the DeSoto Scout Trail or at one of two river fords, provides an easier class 1-3 level paddle trip that ends at Blue Hole. Water levels drop rapidly after rains, and warm weather trips are a rare treat. Hikers can traverse several trails leading into the bottom of the canyon. The river passes between the rocky cliffs and over ledges with huge boulder strewn sections. This creates a beautiful but challenging hiking area. There are few access points through the canyon walls, so be sure you know the entrance and exit points before attempting a hike from one spot along the canyon to another. The DeSoto Scout Trail is the exception, having several well marked exits and offering a loop trail option along the river that connects to the CCC road or the Gilliam Loop Trail in DeSoto State Park. DeSoto State Park is within the boundaries of the preserve and provides visitor services and accommodations. You'll find a pool to cool off in, 24 miles of hiking trails, bike trails, camping, lodge, and cabins. You can explore the rest of the 100 mile-long Lookout Mountain from here. 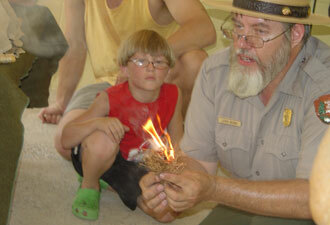 Get out and enjoy the park's great outdoors, take a long hike, explore the river, or tour by car or motorcycle.